Chess board consists of 64 squares in black and brown. The detail is 32 brown squares and 32 black squares, eight rows and eight coloumns. There are many kind of chess board that people choose, such as fold board, chess table, electric board, roll-up chess board, and many more. Here is we introduce carved chess board that made from best quality of Teak wood. Carved by our professional craftsman and polished well. The wooden chess board carved so beautiful and unique. Perfect for indoor chess game, but also use for outdoor need. 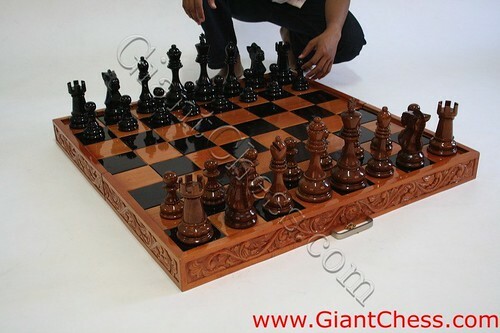 Because made of best wood material, this chess board is very durable product. If you forget when you left it at your backyard for weeks, you do not need to worry about its damaged, because this wooden chess board is durable in any seasons and weathers. Have it now and buy it to us, the manufacturer of chess equipments.